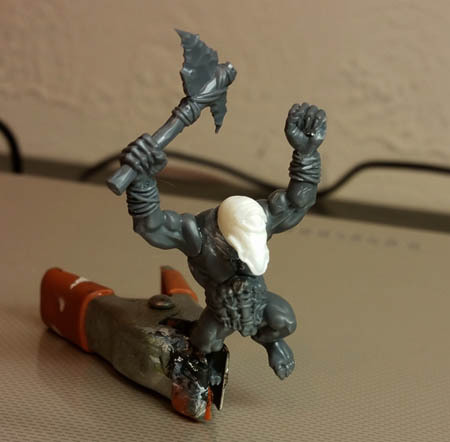 I managed to get my hands on some of the plastic Citadel savage orcs, and have made a few attempts at converting them to Fimir, as I've seen elsewhere. 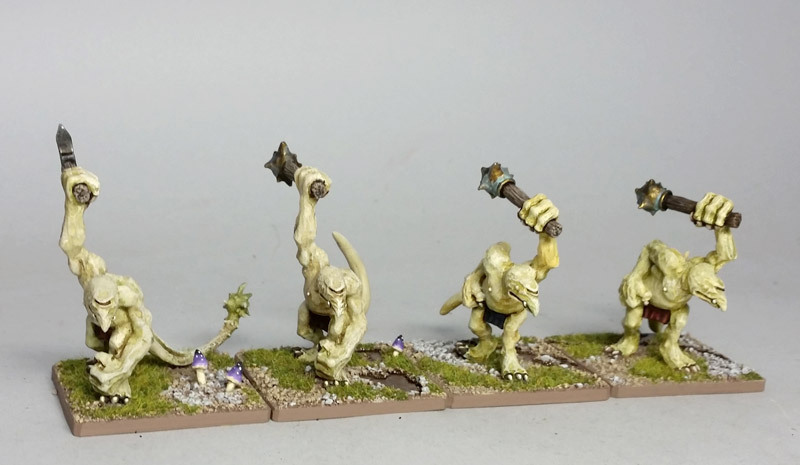 The idea is to use these as the lesser Fimm warriors, and the Reaper conversions would be the elite Fianna warrior caste. Above shows the heads on the bodies and some minor conversions. I just did some putty work on the necks and built some tails. I've got mixed feelings on these. Too many bones, teeth, and other junk stuck on them. I prefer the simplicity of the old Citadel Fimm. I'd also like to try working in more advanced weapons -- a few bone & flint weapons are OK, but I'd still like to see worked wood & metal. I also prefer not to have them all look like chiseled body builders. It seems like a lot of work for less than impressive final results so far. But I'll wait and see how they look painted up. I still may end up trying to sculpt a few simple Fimm, closer to the originals, and cast some of those up. Unfortunately, both painting and major sculpting will likely have to wait a while as I continue to unpack and deal with other crap. But, hey, I managed to unpack my small sculpting box and sit down and work on minis for a couple hours this week! Nice to see you're able to do a bit of modelling :) These don't look like a bad solution, I guess they are readily available and pretty cheap? I agree that I'm not so fond of the stone weapons, but other than that they work okay. Perhaps you could make them more "Fimmy" with some small Celtic touches, maybe some simple bronze roundels, the sort of thing you could mass produce with a press mold? The hands on these orcs are separate from the arms, so I may be able to do some easy weapon swaps if I find some hands that are large enough. I'm thinking about trying some of the old "monkey rat" plastic skaven. Their hands were huge, and the weapons are more advanced, but have a crude & brutal look.